WARNING: THIS CONTAINS SPOILERS FOR TIME OF THE DOCTOR. If you don’t wish to be spoiled about certain extremely important plot details, turn away now. I know I said in my last post that I was going to make a list of Matt Smith’s best episodes (or at least my favorites). I’ll get to that eventually. For now, having seen Time of the Doctor, there are certain thoughts rolling around my head that I need to get out. Before I get into anything else, I want to point this out. I am a Moffat fanboy. I have greatly enjoyed his work on Doctor Who and Sherlock. I think the man is excellent at creating emotionally satisfying and entertaining stories. Moffat came as a welcome change for me when Davies decided to drop the reigns of Doctor Who. Davies, over his tenure, had made Doctor Who a bit too… bleak, for lack of a better word. As a friend of mine once put it, he had turned Captain Jack Harkness into Angel (the vampire from, well, Angel), and it almost looked like Davies was trying to turn the Doctor into Jesus. Davies made everything feel a bit TOO heavy, like we were watching more of a drama than a sci-fi show. Then, Moffat came and brought back the humor, the fun, the sense of adventure that Doctor Who is supposed to have. Series 5 will probably always be my favorite series of Doctor Who. I believe it’s Moffat’s best season (at least so far). It brought back the lighthearted-ness of the Doctor while giving some great dramatic moments that did not negate the good times. 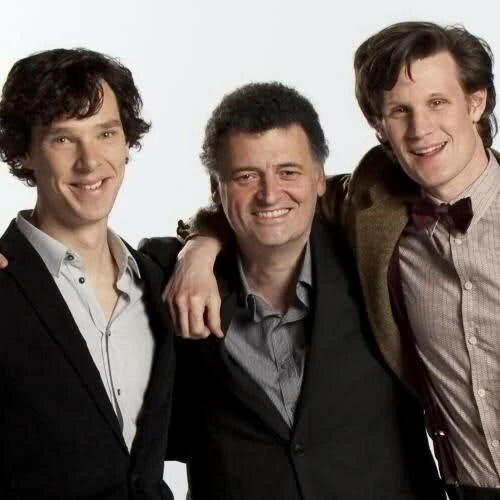 I don’t think Moffat’s lost that sense of fun in the slightest. However, I think he is getting a bit too cocky for his own good. Part of the problem comes from a bit I praised before: Moffat’s stories have a lot of emotion weaved within them. While they are always satisfying on an emotional level, they also felt a bit manipulative on the same level. See, I’ve noticed that Moffat tends to hide a lot of his overly complex stories that don’t make a lot of sense within stories that have high emotions. That way, people tend to focus on the emotional part of the story instead of finding the flaws in the plot itself. That distraction completely falls apart for me once the episode is over. I start really thinking of the story, and I start noticing plothole after plothole. His three most recent stories, Name, Day, and Time of the Doctor, are all particularly guilty of this. I start wondering why characters acted a certain way, why an inconsistency happened, why things feel too complicated to understand. With that last thought, I go into the other part of the Moffat problem: complexity. Moffat feels like he’s falling into the Davies trap. Davies tried for most of his tenure to make every plotline important to an overall goal. Moffat feels like he’s been trying to do the same thing for at least the last half of series 7. Everything felt too big. For the 50th anniversary episode, the hype was so high, so massive, that there was absolutely no way that Moffat was going to satisfy everything he was promising. With this last episode, he had a big promise to fill as well: The Doctor versus all his worst enemies. What did we get? A montage of hard to see battles with things that might have been Sontarans, Cybermen, Daleks, and Weeping Angels. Moffat simply did not give us what he promised to deliver. All of it is part of that bigger problem: Moffat is making things too complicated. At this point, I feel charts are needed to keep up with all the plots and interweaving connections that Matt Smith’s Doctor had to deal with. Moffat sort of succeeded in answering a lot of questions brought up throughout his tenure so far in Time of the Doctor. However, I feel like it’s all still a bit up in the air. Things don’t feel like they’ve gotten less complicated. The Doctor has been given more regenerations and Galifrey is still out there. Questions still remain. I may be in the minority, but I sort of hope those questions aren’t explained any time soon. The Doctor is a new man. This is the opportunity for a fresh start. Moffat needs to let go of the big, complicated questions for a little while and take a breath. I, as a fan, feel like I’m on the verge of emotional burn out. With a clean slate, I feel like the Doctor needs to go back to something simple, at least for a while. It will give the audience time to recuperate. As I said before, I still think Moffat is fantastic at telling stories. I just believe that he needs to go back to something simpler for a time. With this past season, it felt like he was trying to rush to something huge and wasn’t taking the time to plan it out right. If he takes this time with a new Doctor to make something new, something not too complicated, I think everyone will be happier for it. I think this will be my last Doctor Who related blog for a while. I just feel a bit burnt out from talking about it. I will blog in the future about my favorite Matt Smith episodes, but that can wait for now. Also, let me know how you feel about Doctor Who, Moffat, Smith’s departure, anything of the sort in the comments. I welcome all alternate opinions. Until next time, Happy New Year, everyone! Another Doctor Who post coming right up! It’s common knowledge that, when a person loses a loved one, they go through 5 stages of grief: Denial, Anger, Bargaining, Depression, and Acceptance. Let’s call this blog part of my Anger phase. In an effort to let go of my favorite Doctor, I feel it’s important to look at a few episodes that I found lacking one aspect or another. Instead of the prerequisite Top 5, I’ve selected my least liked episodes from each season and my least liked of the Christmas specials starring Matt Smith as The Doctor. Let me first make clear that, even though I feel these episodes are weak, I still find them enjoyable in one way or another. Nothing will ever be as bad as “Love and Monsters” in my eyes. I love a good vampire story. Vampires, while being one of the most over romanticized horror icons, are still scary and make very interesting stories. This story, however, has a twist. These vampires aren’t vampires at all: They are alien fish disguised as humans… Yeah, when you put it that way, it’s really silly. I just couldn’t buy the whole fish angle. It seemed a bit too weird for me. The plot, when it comes to the aliens, is also pretty simple and boring. They want to flood the world so that their race can take over. For this show, it’s simply too “par for the course.” With an uninteresting plot and weird aliens, I just couldn’t find myself completely liking this episode. Still, the fish-pires are still better vampires than anything Stephanie Meyer could think up. Pirates! Just the word calls to mind the high seas, big adventures, piles of gold! You’d think Doctor Who would make a great, action packed pirate adventure, right? Wrong! Instead, we get a semi-horror themed episode where everyone gets picked off one by one. And who’s the culprit? A pseudo-ghost. (The episode has a more sci-fi-y explanation.) The fact that it was a horror episode is fine. I just find it disappointing that the Tardis ends up on a pirate ship and nothing pirate-y really happens. They tried to stick a sword fight into the episode, but it didn’t last very long. Pirates were just an incidental element of what could have been a story of high adventure. The TARDIS is one of the biggest icons of nerd culture on the planet. Ask any nerd what they think of when you say the words “blue police box” and they will say “Doctor Who.” An episode exploring the vast complexities of this fantastic time and space device is just what The Doctor ordered. However, it’s not what we got with this. Instead, we got an extended chase sequence that happened to be inside the TARDIS. We didn’t really get to experience what the TARDIS had to offer. Plus, the ending of the episode completely negates the entirety of what happened. I DESPISE those types of stories. If your story ends either with it all being a dream or something happening that means the rest of the story didn’t really happen, then what was the point of your story? I know, I know, I’m getting too complicated and too angry for a blog. Still, this episode was massively disappointing. As I said, although I didn’t enjoy these episodes as much as others, I still enjoyed parts of them. Vampires of Venice had an original take on vampires while still remaining faithful to the lore (ei, no reflections, no sunlight, biting people, etc.). Curse of the Black Spot was a decent horror story. Centre of the TARDIS had some very good scenes with the Doctor and Clara. Even the Christmas special mentioned had that fantastic Christmas feeling, preaching family, togetherness, and good will in a very nice way. Before we start: This is going to be another Doctor Who post. Fair warning. Not interested in Doctor Who? This article is not for you. Thanks for stopping by! Also: My last post is now basically debunked. Steven Moffat has his own plans and they will become apparent in the upcoming Time of the Doctor special on Christmas Day. Pity, really. I really liked my theory. Oh well. Ladies and gentlemen, Matt Smith is My Doctor. If you’re a Whovian, then you know exactly what I mean when I say he’s My Doctor. Coming this Christmas, my Doctor’s time is up. 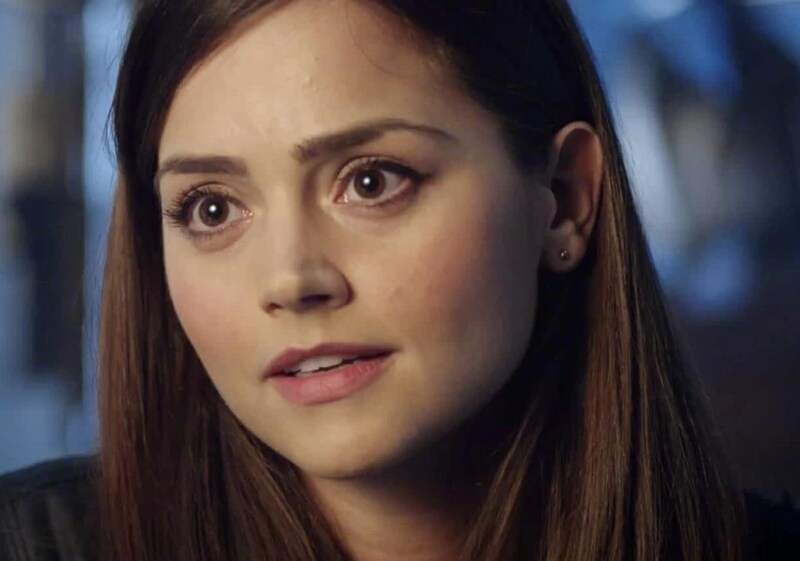 As such, I’m using this post as a way to talk about my favorite Doctor, how I feel about seeing him go, and even how I came to like Doctor Who in the first place. A couple of years ago, I was hearing a lot about this show about aliens and time travel. It seemed that wherever I turned on the internet, I’d see a mysterious blue box and a man wearing a bow tie wielding a glowing green metal stick. A question was haunting me. Doctor… who? My curiosity peaked. I did research and saw that the show had a rich and vibrant history. I just didn’t know where to start. I consulted a friend who told me “start with the Eleventh Hour. It acts as a good jumping in point for newcomers.” So, I did. I hunted it down and watched. Only an hour later and I found myself completely hooked to the show. Since that day, I’ve seen every episode of the new series and have gone back to watch the classic Doctors. (If you’re curious, I’ve seen a few eps of Hartnell, the last serial of Troughton, the first serial of Pertwee, all of McCoy’s era, and the movie from the 90s. So far anyway.) Despite liking every Doctor I’ve come across so far, Matt Smith was my first and is my favorite. As I have watched him, I have felt more of a connection and relation to him than I have with any other Doctor I’ve seen so far. Matt Smith’s Doctor is the biggest nerd out of all the Doctors I’ve seen. 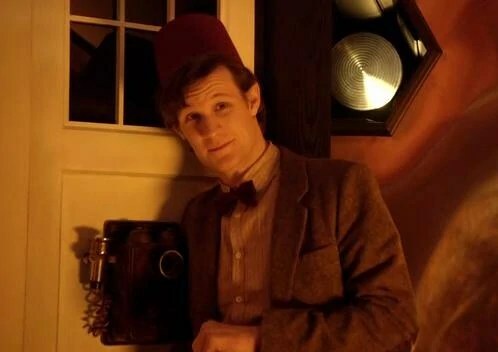 He wears fezzes and bow ties as attempts to be cool. He’s clumsy at times but always seems to have all the information he needs to handle any situation. He often talks quickly and tries to act clever. He has an energy as the Doctor that immediately captured my attention. His seasons, for me, were the most enjoyable, having interesting story arches and some of my favorite episodes as well. Bottom line, I was entertained by him the most out of any Doctor I’ve seen so far. This coming Christmas, my Doctor is taking his final bow. Personally, I hope he goes out in a blaze of glory. When he eventually does regenerate into Capaldi’s Doctor, I’m going to be sad. I’m going to miss that big, goofy grin, that swooshy hair, the energy and spirit he gave the role. However, I am hopeful for the future. I’m confident Capaldi will make a great Doctor. I look forward to whatever type of performance he has in store for us. For now, goodbye, my Doctor. Bow ties will never be the same again. This post will be about the Doctor Who 50th Anniversary episode, The Day of the Doctor. If you haven’t seen it yet and wish to, leave this article NOW. If you’re not a fan of Doctor Who, have never seen it, or don’t care about it, you won’t want to read this either. Alright, onward to my theory! Before I get into anything too complicated, I want to say that I loved Day of the Doctor. I thought it was decently action packed, really funny, well acted on all counts, and just all around really good. That said, like many things with Doctor Who, I thought it was a bit overly complicated. And, because of its overcomplicated-ness, it was riddled with plot holes. Now, I’m not going to attempt to explain away every plot hole. I don’t have that kind of brain capacity. However, last night, I developed a theory that may explain one that really bothered me: John Hurt as The Doctor. Before I can get into that, though, I have to explain why the theory was needed for me in the first place. The Doctor regenerates himself into a new face whenever he dies (or is about to die). If you’ve gotten this far into the article, you probably knew that already. You also probably know that he apparently is only supposed to be able to do this 12 times, allowing for one man to have 13 faces. Until the 50th, we had a set order with set numbers to set faces. 1) William Hartnell, 2) Patrick Troughton, 3) John Pertwee, 4) Tom Baker, 5) Peter Davison, 6) Colin Baker, 7) Sylvester McCoy, 8) Paul McGann, 9) Christopher Eccleston, 10) David Tennant, 11) Matt Smith, and the upcoming 12) Peter Capaldi. However, thanks to the 50th Anniversary special, and especially this clip that was released online that was supposed to be watched before the episode, a wrench was thrown in the works. There was now an extra face between McGann and Eccleston: John Hurt. For me, this just didn’t make sense. Did that mean that everyone after McGann is now one number up? Did the Doctor have no regenerations left after the one to come this Christmas? According to the current main writer and “show runner” of the show, Steven Moffat, no, the order’s not screwed up. Why? Because John Hurt’s Doctor wasn’t calling himself The Doctor. He was a Warrior, NOT The Doctor. So, he just “doesn’t count in the official timeline.” I have major issues with this. First, we clearly see Paul McGann’s Doctor turning into John Hurt’s Doctor in the above clip. Second, simply put, I thought John Hurt’s Doctor, despite only really appearing in this special, did too well to not be counted. I just liked him too much to just say he “doesn’t count.” It’s like an insult to the man, sweeping him and his performance under the rug because it screwed with long known continuity. The problem is, Steven Moffat is arguing grammar and semantics in an argument about math. Twelve plus one is always going to equal thirteen. There’s simply no way around it. How can you make twelve plus one still equal twelve? Unless “plus one” wasn’t really a “plus one.” Here’s what I mean. If you watched the above clip, you saw the 8th Doctor, McGann, crash on a planet and is approached by the Sisterhood of Karn. They say that the Doctor has 4 more minutes to live and offer him a potion. The potion, while apparently not saving him, would allow him to chose the type of person he’d regenerate into. Every time before and since, the Doctor had no control about what type of person he’d become. Now, in the middle of the literal biggest war of all time, the Doctor chooses to become a warrior. He basically feels that he can do more good now as a warrior than as the Doctor. Thus, he drinks the potion and regenerates, turning into John Hurt. My theory: What if that wasn’t a regeneration? To put it a different way, what if it wasn’t a “natural” regeneration? The Sisterhood says that the potion the Doctor drinks will trigger a regeneration and make him anything he wants to be. However, he takes the potion before he really dies. My thinking is that the potion saved his life before he died and reformed him, NOT regenerated him. So, instead of him regenerating into a completely different Doctor, he instead becomes different version of the 8th Doctor, one more equipped and willing to fight in the Time War. In essence, the regeneration is more of a reformation, a false regeneration brought on by advanced technology (as the Sisterhood calls it) rather than a natural one brought on by a Time Lord’s natural ability. So, instead of the 9th Doctor, John Hurt can be instead considered as Doctor 8.5. I know it seems a bit overly complicated and unnecessary to make this theory. The fact that I was even bothered by the plot hole at all shows how much of a nerd I am. However, in my opinion, my theory makes about as much sense as any other theory. Steven Moffat asking us to ignore John Hurt as the Doctor because he technically “wasn’t” is just rubbish. I have already accepted my own theory as what happened much as other Whovians have developed their own theories about other such things. If anyone would like to prove me wrong, I invite you to share your thoughts in the comments. If you have any theories about anything else DW related, also feel free to let me know what they are. I’m interested in reading a few. Sorry for such a long, technological, and nerdy post from me today. That’s just the kind of guy I am. I will make the next blog much less confusing for those who are not all that much into Doctor Who yet. It will still be about the show, though. I’m simply in that kind of a mood right now. Until next time, keep a look out for aliens in disappearing blue boxes.